This is not your grandma’s chicken pot pie recipe. 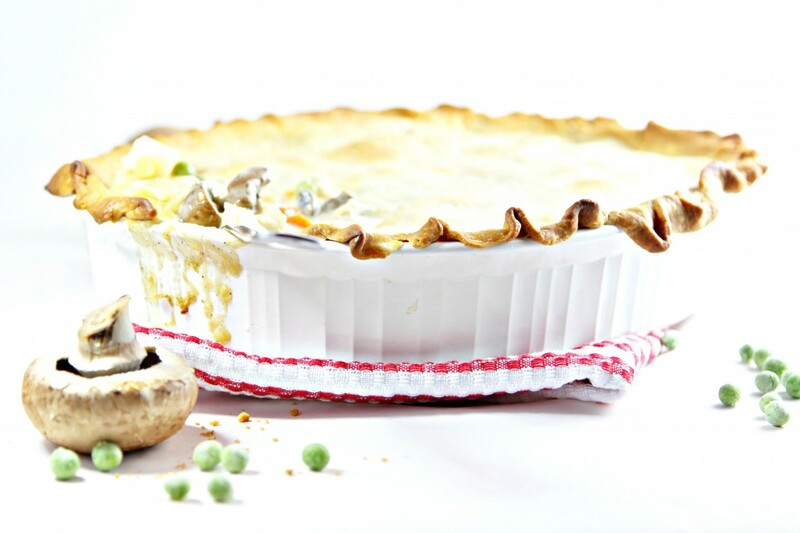 Mushroom Marsala Chicken Pot Pie adds a little oomph to a classic casserole and will be having everyone coming back for seconds. Pot pie. It’s a funny name isn’t it? I suppose the initial portion of the recipe is made in a POT. It is a savory PIE. So if we’re going with logic it makes sense BUT the name still throws me. What can I say? I don’t let the name stop me from eating it though. Oh no. I love pot pie. Especially when it’s freezing outside and I need all the help I can to warm up. I love making chicken pot pie after I’ve made a ROASTED CHICKEN. I typically will roast two at at a time. Why not, you’ve already got the oven on yeah? Then I get the added benefit of a take two meal. You know a meal made using leftovers. It’s a beautiful thing. It also works great with leftover turkey. I’ve been using the same POT PIE recipe forever. I haven’t altered it much over the years except to use puff pastry in place of pie crust when I didn’t have one or the other on hand. Sometimes you just don’t want to mess with a good thing. Until you have an idea smack you on the forehead. That idea came in the form of baby bella mushrooms. I put on a pot of HOMEMADE CHICKEN STOCK and began to pull together the ingredients to make this chicken pot pie recipe. While I was in the fridge rummaging for carrots, onion, celery, leftover chicken, etc. I saw a container of beautiful baby bella shrooms staring at me. There’s chicken and MARSALA in the pot pie. What about US? We go together like sha-na-na-na-na-na , okay you get it. I halved those beauties, plopped them into the POT and let’s just say I’m probably not going to be making a pot pie without them from here on out. 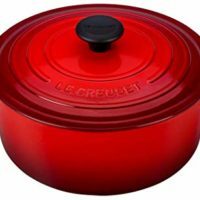 Melt butter in a french oven over medium-high heat. Add: onion, potato, celery, carrots, garlic and mushrooms. Season with nutmeg and salt/pepper. Cook for approximately 10 minutes OR until vegetables are softened. Stirring as necessary. Add Marsala and deglaze pan. Add chicken. Sprinkle flour on top. Stir to coat. Add chicken stock and bring to a boil. Add cream and peas and stir to combine. Check for seasoning. Adjust as necessary. Transfer mixture to one large oven proof dish or several smaller oven proof ramekins. Place pie crust across top of dish /dishes. Crimp edges. Bake for 20-25 minutes OR until crust is flaky and golden. What a beatiful pot pie! I can’t wait to try this one! I think it’s time for a chicken pie! Sounds amazing!! oh I love this…I’ve never made pot pie but would love to try it. This looks fantastic! 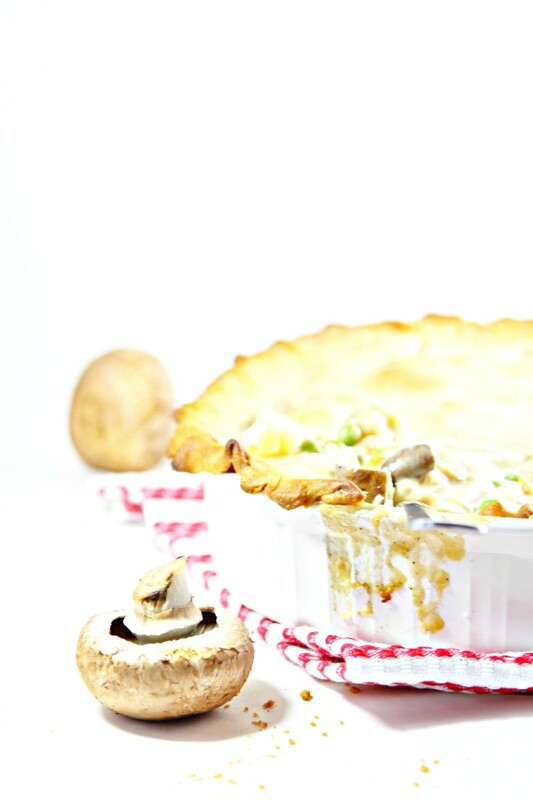 It’s been WAY too long since I’ve made pot pie…I think I need to get some ‘shrooms and make up for lost times! Marsala is pot pie form?! Genius! There is nothing better than pot pie on a winter’s night. And a mushroom marsala version? I think I’ve died and gone to heaven! Cool gig and fabulous dish! I love that you added mushrooms!! Great idea for pot pie! 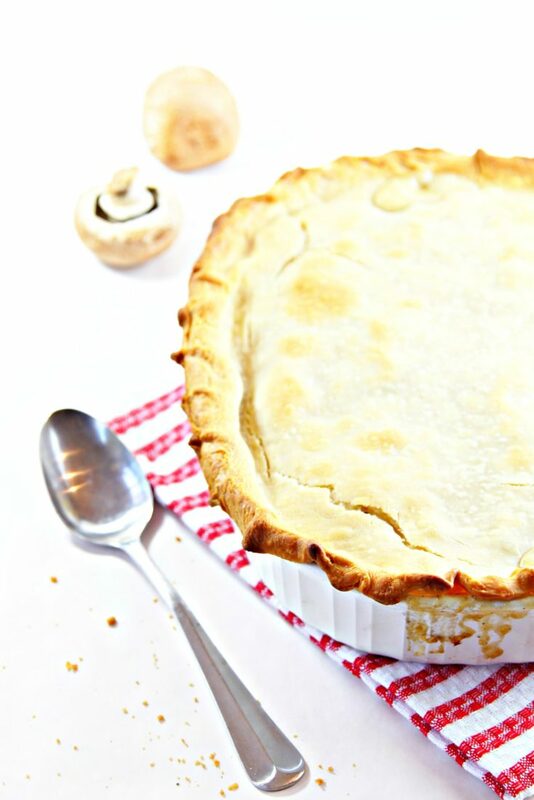 Love this twist on pot pie!! Very creative! I’m a top crust only pot pie chick too. Let’s be pot pie sistas. This looks amazing!! Pass me a spoon. I am obsessed with pot pie, big time. This version looks out of this world! I love chicken marsala. I never even have had a whisper of a thought about using it this way. Champion idea. I love pot pies! Using chicken marsala is an awesome idea! Yum! Pot pies with the homemade crust and gravies and veggies are so awesome! Mmmmm…I love comfort food dishes like a gorgeous pot pie. Great way to add in some mushrooms!!! Ohhh, I love pot pies, and the sound of a marsala-sauced one is driving me wild! I love making chicken pot pies but normally I make it just like my grandma. Love this fun and gourmet twist! Nothing is more comforting than homemade chicken pot pie. Love that you added mushrooms and marsala.